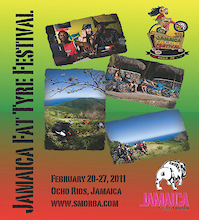 Hanging out at Conscious corner during the Jamaica Fat Tyre Festival. We have a variety of... Grocery items, Meat, Liquor _We also have_ Engine Oil, Transmission Oil, Brake Fluid etc. and amazing blue mountain coffee..
School running race. HOT pavement and lots of bare feet. A couple of the faster boys had water bottles, not to drink but to pour on their feet! Jamaican children are so amazing!